i dread the question, “where do you see yourself in 10 years?”. i could answer it jokingly: “instead of being a cat lady, i’ll be a cake lady.” but that’s not what people mean. aside from the next year-ish while i finish college, i have no idea about those other 9 years. maybe i’ll be in california, maybe i’ll be working in marketing, maybe i’ll still be close to my current friends. or maybe not: what if an amazing opportunity comes up somewhere else? what if i never see some of my friends again? (a real possibility since some are international students who will probably go home post-grad, and our friendship isn’t strong enough to last solely in a virtual realm). i know i’m not the only one intolerant of this question; there’s a lot of not-quite-quarter life crises on college campuses right in front of your nose. we’re barely into our second decade (and some not even), merely babes in the wood. how are we supposed to of us know?! (if you’ve wanted to be a doctor since you were given a stethoscope at the age of 5 and haven’t wavered and are still striving towards that, i’m jealous). i’m assuming that i’ll make my way to an office job, hopefully one that’s somewhat interesting and personally fulfilling, at some point. and i’m definitely romanticizing the work grind, but i can imagine the chillest weekends, preferably with some brunch thrown in for the mix. i usually go out for it, though i’m not sure why: the wait time is usually ridiculous, and i feel gypped by how much they’re charging me. so you can picture a semi-frugal 31 year old (probably everyone has done this but: WHAT 31 I’D BE LIKE THE CRYPT KEEPER) me with a serving of bacon mushroom saute with japanese sweet potato mash in a kitchen somewhere. i like that vision. i was originally inspired by a smoked mushroom dish from ‘aina, a nouveau hawaiian brunch place in sf. their version has smoked honshimeji & king oyster mushrooms, poached eggs, okinawan sweet potato purée, portuguese sweet bread and lap cheong. and this dish… doesn’t. not quite. there’s no portuguese sweet bread, the lap cheong became bacon, i didn’t make the mushrooms smoky because the bacon was already smoked. so if you’ve had this dish from ‘aina and you’re like…. girl, this bacon and mushroom saute with japanese sweet potato mash isn’t the same thing at all, you’re right. there’s loose inspiration but no direct translation. anyways. i was leaning towards cubing the potatoes and pan-frying them into homefries, but there’s something really cozy to me about mashes, so that’s what i went with. in addition to the fact that the bacon already locked down the crispy element, so crackly, instagram-worthy golden brown potatoes weren’t necessary. and then a side product of that aforementioned bacon, the fat, was used to saute off mushrooms, onion and garlic. mhmm. all that nutty potato, with hearty, savory-because-of-the-onions-and-garlic-but-sweet-in-a-vegetal way mushrooms. 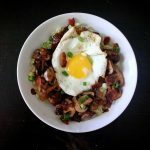 topped with a fried egg (i know creamy, runny yolks are The Thing, but i’d much rather have my eggs over hard, thank you very much), salty bacon and a sprinkle of sharp green onion. 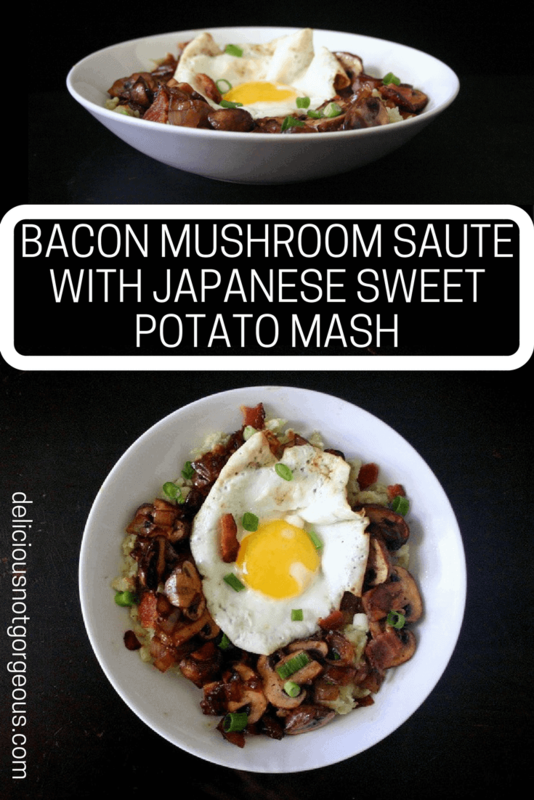 if this bacon mushroom saute with japanese sweet potato mash doesn’t make you pro-brunch, idk what will. This bacon mushroom saute with Japanese sweet potato mash is hearty and perfect for anything from a Sunday brunch to a cozy dinner. Place the potatoes in a medium pot and add water to cover. Bring to a boil, then lower the heat and simmer for 10-15 minutes, or until fork-tender. Drain, then mash the potatoes with a potato masher or fork. I like my mashes pretty chunky, but you could add milk, cream, broth, etc and use a hand mixer if you want it smoother. In a large pan, cook the bacon until crisp. Move the bacon to a paper towel-lined plate to drain, and remove most of the grease from the pan. Place the same pan over medium heat. Add the onion and garlic, and saute until translucent. Add the mushrooms, and saute until they brown and shrink. Move the onions, mushrooms and garlic to a bowl. Add a little bit more bacon fat to the pan, and cook the eggs however you like (I like fried). Crumble the bacon with your fingers, or chop it up. 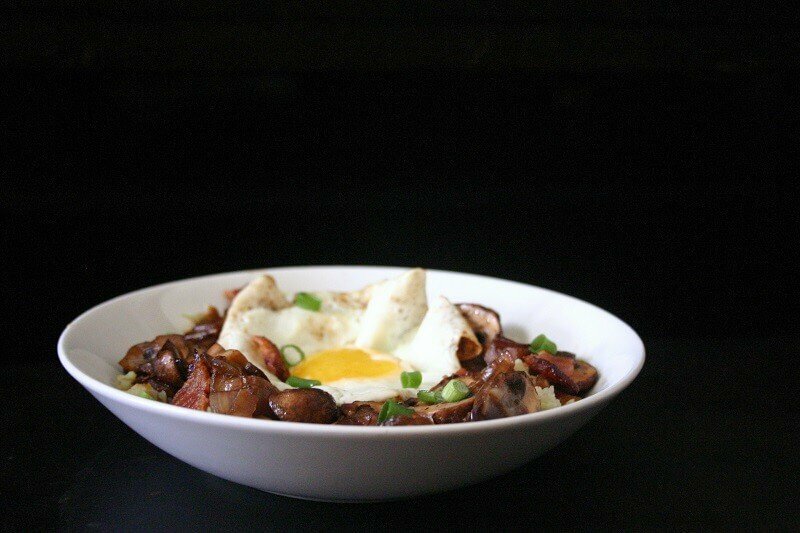 Divide the sweet potatoes between 4 bowls or plates, then top with the mushrooms, eggs, green onions and bacon. Japanese sweet potatoes (the ones here were white, but there are purple ones too) are super nutty tasting, like a chestnut, which is different from normal orange sweet potatoes. Don't make me pick which one is better; I'm going to plead the they're different I can't compare them card. Yummmmm. 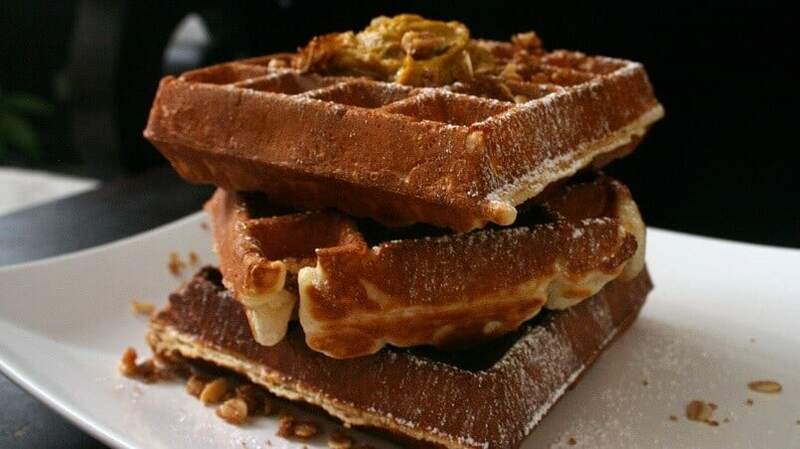 I totally want this for brunch! And that clip totally made me laugh (and feel hella old). All that matters is that wherever you are in 10-years, you are happy and love whatever it is that you are doing. We spend the majority of our lives at work so being stuck at a miserable job is, well, miserable! Lol. freaky friday is the best (and now i’m going to try very hard not to find a copy and watch it RIGHT NOW). I’ve not tried Japanese sweet potatoes before, I shall need to find some as this sounds delicious! This is such perfect brunch food! I’m craving it for next weekend :). I hate the where do you see yourself question, and I remember being asked WAY too much when I was finishing college. Hi, I hope that in 10 years nobody asks me that question because it makes me ridiculously anxious. Have a great week, Heather! definitely perfect brunch food! hearty, but also not nap and food coma inducing (: and lol, i kind of imagine still not liking that question in 10 years. This looks so yummy! I didn’t even know Japanese Sweet Potatoes existed, I’m now determined to track them down, by what a great combination you have here. The 10-year question (or even the 5-year question) always stressed me out a bit, too. I think they just want to hear that you’ve thought about it and want to be successful and enjoying what you do, that you have something of a plan, (not that they’ll hold you to it.) Who doesn’t want that? i hope you can track them down! i used murasaki sweet potatoes from trader joe’s here, but i really like the purple ones; they’re so cool looking :3 and about the 10 year question: i usually mention that i’m still exploring and it gets met with a big big “hmmmmmmmmmm.” oh well. I never realized a meal could end up being my soul mate… I am totally into this recipe. The 10 year question is one of the most infuriating and stupid questions people ask. What we want can change so quickly for me it changes every few months – right now I just want to be travelling all the time. But what I wan’t right now is a big bowl of this deliciousness. Pinning to try for brunch this week on my day off! Japanese sweet potatoes are my childhood favorite, granny would usually steam, mash coarsely, stir in freshly grated coconut, cardamom,ghee, some sugar and shape into balls. We would happily gobble them up in the evenings:). These sound scrumptious too, happy week Heather! whoa that sounds so tasty 😋 i’ll have to try that out, but i’ll probably eat it as a mash and forgo shaping the mixture into balls! OHHH! I would totally eat this anytime of the day of the week, breakfast, lunch or dinner. It looks soooo divine Heather! Happy Tuesday!! When I was your age I had allll the same questions and wonderings and guess what – a decade later, I still do. Haha! You never know where you’re going to be until you’re there. Life is full of curve balls, but that’s what keeps it exciting! (I do, however, envy those people that knew they wanted to be a doctor at 5 years old). This dish looks fantastic. I must ask – where do you get your white Japanese sweet potatoes? I’ve only seen the purple ones! i’m a planning, list-oriented person, so i want to know, but i know what you mean even now (very few of 5 year old me’s imaginations match my life right now, shockingly enough). i get these white sweet potatoes at trader joe’s! they taste super similar (i haven’t had a side by side tasting so i’m not sure if they taste similar or are actually the same), but that purple color is so mesmerizing. Brunch is definitely my fave meal, besides breakfast of course. I’m a huge fan of Japanese yams, and this looks amazing! i have some things planned for next week, but they’re the sort of things that i shouldn’t be doing (theme parks! aesthetic ice cream! ), considering i have finals in a couple weeks. oops. We get two types of sweet potato here, yellow or white (haha). Never heard of Japanese sweet potatoes before. This looks like pure comfort food! what do those ones taste like? i’m familiar with the bright oranges ones that taste mostly of sweetness, and are pretty soft when cooked. the ones here are more on the nutty, chestnutty side, and are a bit firmer than the typical orange ones. And as far as this dish? Holy yum! I love that you cooked the mushrooms in a bit of the bacon fat. That sounds like my kind of meal right there! i usually don’t make elaborate things for breakfast/brunch (i’m not a morning person to say the least), so for me it’s a way to have something a bit nicer in the mornings. no idea when/where brunch became a thing! i was in chicago 3ish years ago, and i remember it being a huge thing already over there. 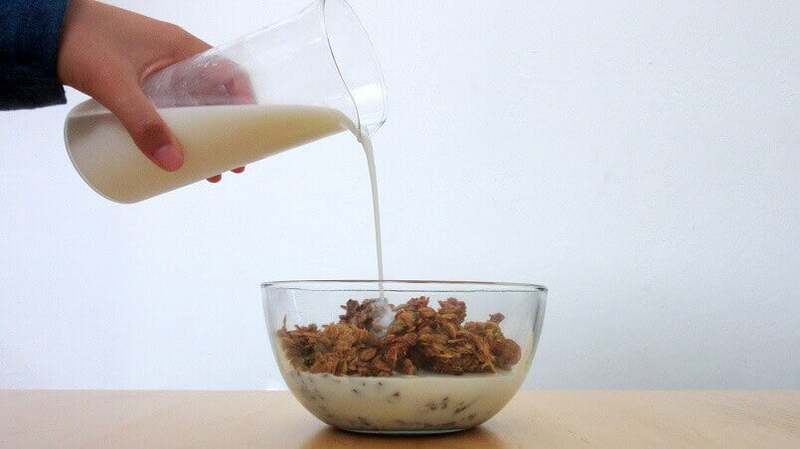 This sounds amazing for breakfast, lunch AND dinner. I loove white sweet potatoes- just recently discovered them here in Morocco as well! it’s an all day, every day kind of dish! can i have the good surprises and leave the bad ones? (; kidding. sort of. Yummy! I could eat this dish all day long. Such a finger-licking recipe, Heather! I want this in my life RIGHT now!! So simple and delicious. I agree on the ten year question. I’m coming up on my 20 year high school reunion, and I am no where close to where I thought I’d be. Which was where again??? I don’t even remember. What I do know, is that I went to college for teaching and taught for 7 years, and I’ll never use my college degree again because now I’m doing what I really love to do. Life takes you in unexpected directions without asking you first. You will find your path! i know that bloggers come from all sorts of occupations but it seems like a bunch of you used to be teachers! anyways, thanks (: the last sentence was very motivational lol (maybe your next career is to be a motivational speaker??). if heaven doesn’t have bacon and mushrooms and potatoes (among other things), is it really heaven? Well, I am 31 and still don’t have the answer to that question. I just come up with a new ans every time some one asks me that, because there is simply no way of how your dreams and hopes and likes and dislikes are going to change! But its nice to ponder over life’s deep and complicated puzzles over cozy dishes like this one! oooooh this sounds good, I’d eat it. I’m 44 years old and I still cannot stand that question, where do I see myself in ten years. Hopefully, I see myself sitting down at a desk writing my novels, but who knows? It’s like the stupidest question ever. ooh what kind of novels? i think the hardest part about novels is finishing (blog posts are much shorter/easier lol).